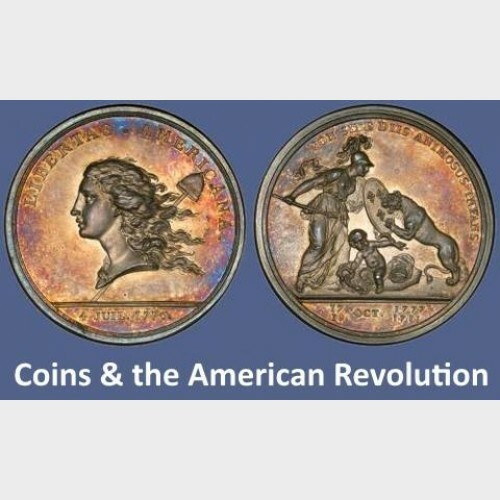 Before there were US coins… before there was even a US mint… there was the American Revolution – a war fought to secure liberty and independence for the rebellious English colonies. During that conflict, the American Continental Army was largely outnumbered and outgunned by the occupying British forces. Nonetheless, there were some American victories. On the strength of the American win at the Battle of Saratoga, and the persistence of diplomatic envoy Benjamin Franklin, the French government decided that support for the breakaway American colonies would be a great way to revenge British victories over the French in Canada. The French Navy and a large contingent of French troops the decisive factor in the 1783 American victory at Yorktown – which effectively ended the Revolutionary War. Later that year, Benjamin Franklin collaborated with French engraver Augustin Dupre to produce a medallic tribute to French assistance during the war. The result was a spectacular striking in both silver (see photo) and bronze which became known as the “Libertas Americana” Medal (see photo.) The symbolism is unmistakable: the British lion repelled by Minerva with a shield emblazoned with the fleur-de-lis of France, protecting an infant America -- who in turn is strangling two serpents labeled Saratoga and Yorktown. The image of Liberty on the medal’s obverse became the model for some of the first coinage of the United States, beginning with the Liberty Cap Half Cent of 1793 shown in a photo below.